Hey…Angelina…ppssstttt…what’s with the leg and the poses? Call me a freak but, I find the Academy Awards nothing but a ridiculous showcase for fashion designers. Were they wearing people or, are they people? One stuck out amongst the hundreds of other “stars” in this vast sea of designer outfits as she stood upon the stage as a presenter, posed and flashed her leg throughout the entire segment…Angelina Jolie. What was with her? Is she getting some type of a kick-back from the designer for promoting their designs or, is she so enamoured with her anorexic looking stick leg that she feels the need to stick it out constantly? It seemed that every shot taken of her throughout the night last night, entailed her pulling back the dress or posing in such a way that her right leg was protruding through the slit in that dress. Has she gone to the point of finally feeling she’s thin enough and proud of it? What gives with that leg? The height of the evening was not all that obvious at first, during a moment of hurrah for the receipients of an Oscar but, when Jim Rash, did his impersonation of Jolie’s presentation pose, it spoke volumes. Though, has said that it was only a joke, Rash seemed to echo what a lot of viewers were really thinking and feeling about the absurdity of Jolie’s “look at me” posturing. Bravo to Rash. It gave us all pause to laugh instead of still scratching our heads in befuddlement as to how someone could think that much of themselves. He brought it back to human level. 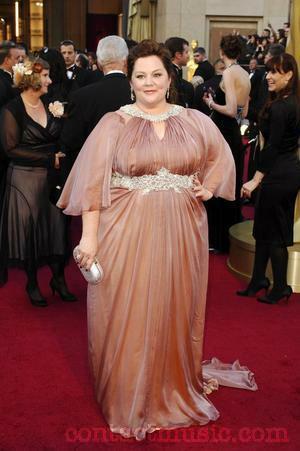 Amongst the throngs of the bulemic and anorexic looking stars, stood a true star, Melissa McCarthy. Plus sized or not, McCarthy’s humour in her little skit with Billy Crystal a la “The Bridesmaid” style, was priceless and showed the world that stars don’t have to be stick thin to be beautiful. They also don’t have to be unreal. Though plus sized in a world where The Skeleton Look is considered beauty, McCarthy stood out amongst the rest. It wasn’t because of her size but, because she was daring enough to be beautiful in spite of what Hollywood would consider to be ugly and disgusting. Brava to Ms. McCarthy for allowing her true beauty to shine through without fanfare, without being stick thin in a world where the thinner you are, the better you are adored. Credit is due where credit is due and knocks are due where knocks are due. McCarthy deserved the credit and Jolie deserves a knock.